Looks like things are moving right along as planned. Great job to everyone working at LAWA! 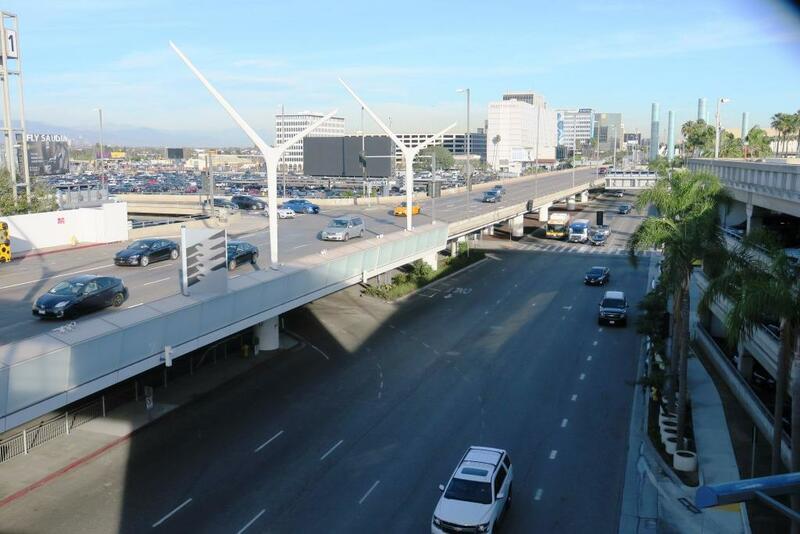 Two projects in the terminal loop will restrict the right-most lanes on the Lower/Arrival Level overnight near Terminals 1-2 and the Tom Bradley International Terminal. LAX G Shuttle picks up and drops off passengers at the Hawthorne/Lennox Station until April 7 during a Metro project that has suspended Green Line rail service further west. Westbound 105 ramp from Northbound 405 closed until the end of April. Upper levels of Parking Structure 4 can only be reached through Parking Structure 3 until early summer. The two right lanes in the pick-up area between Terminals 1 and 2 on the Lower/Arrival Level will be closed overnight for a water line replacement project. Work will take place 11:30 p.m. to 7:30 a.m. daily. Metal plates will be used during the day to allow vehicles to access the lanes. A portion of the sidewalk between Terminal 3 and the Tom Bradley International Terminal on the Lower/Arrival will be restricted to 8 feet wide during the day and closed overnight during a “jack and bore” operation to drill a conduit for the replacement of power vaults that will serve the new international concourse and its baggage handling operation. Work will take place overnight, from 1 to 8 a.m., at which time the sidewalk and at least one right lane will be closed. Pedestrians will be detoured across World Way onto the sidewalk in in front of Parking Structure 3. The main construction area at Terminal 1 is located near the center of the building. During busy travel times, such as early morning and midday, passenger drop-off can cause traffic backups on the roads leading into the terminal loop, affecting access to all other terminals. To avoid traffic congestion at LAX from early morning to 2 p.m., motorists are asked to use the Lower/Arrivals Level to access the parking structures or drop off passengers, who can then take elevators, escalators, or stairs up to the Upper/Departures Level. Lanes of Sky Way, which carries traffic east toward 96th Street, will be closed for resurfacing overnight in mid-March. Occasional and intermittent lane closures are possible overnight throughout theterminal loopfor the painting of pavement markings including crosswalks. New trailers are being installed in the former Vendor Lot 6, which may require overnight changes to the traffic pattern on Center Way. Caltrans has closed the westbound Interstate 105 ramp from northbound Interstate 405 until late April for a roadway rebuilding project. Motorists heading to LAX can use Century Boulevard or Imperial Highway to Sepulveda Boulevard as alternate routes to reach the airport. Motorists heading to LAX from Orange County or Long Beach should also consider using Interstate 110 north to Interstate 105. The work will have no impact on Interstate 105 itself, and the ramp from southbound Interstate 405 will be unaffected. Metro has suspended rail service on the Green Line west of Hawthorne/Lennox Station until early April while building a connector to the new Crenshaw/LAX Transit Projects. While Metro will provide a bus that stops at the remaining Green Line stations, the LAX G Shuttle will pick up and drop off passengers at a stop on southbound Hawthorne Boulevard, just north of Imperial Highway, so they can board the Green Line at Hawthorne/Lennox. The G Shuttle will not service the LAX/Aviation Station while rail service is suspended. Jenny Avenue between Westchester Parkway and 96th Street will be closed to through traffic. 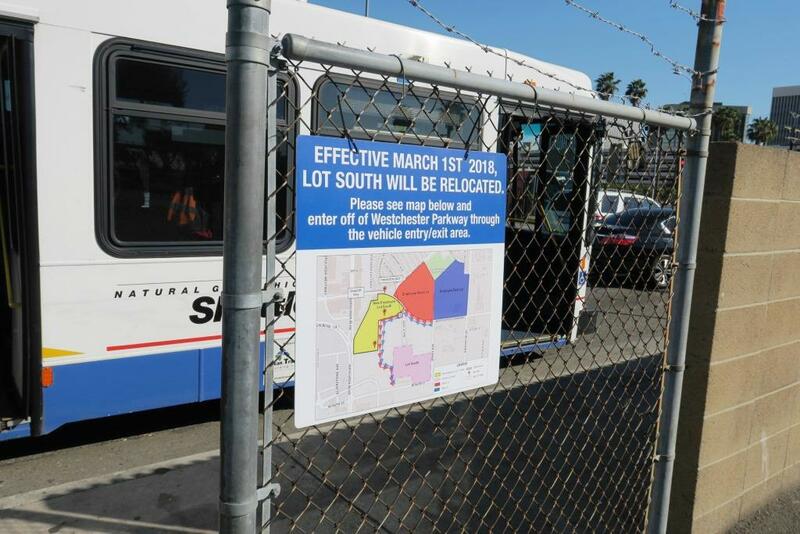 Bus stops on Jenny Avenue will be relocated, with the employee parking shuttle making pick-ups and drop-offs at the newly configured South Lot. Boring in advance of construction of a new water trunk line will take place on the north side of 98th Street between Sepulveda Boulevard and Aviation Boulevard starting in early March. Through traffic will bepreserved, but some metered parking spots may have be closed as the work progresses. SoCal Gas pipeline cleaning and maintenance will require the closure of the right lane of northbound Aviation Boulevard at 104th Street until May. In addition, through traffic will not be able to use 104th Street between Aviation and La Cienega boulevards. A detour will be posted. Terminal 1: Phase 3 of Southwest Airlines’ $515-million Terminal 1 Renovation Project is taking place in the central part of the terminal. New restrooms are open on the concourse, just past the Security Screening Check Point, between Gates 9 and 10. Passengers reach the checkpoint via a new section of the hallway. Temporary all-gender restrooms are available on the west side of the ticketing lobby, and guests may also use restrooms located on the Lower/Arrivals Level or in the terminal past the Security Screening Check Point. The food court in the south end of the terminal is closed, with guests directed to establishments further north in Terminal 1. Westfield is phasing in new concessions later this year. Renovation work in the area of the escalators will take place overnight, with arriving passengers directed to the escalators in the Security Screening Check Point after 11 p.m. nightly. Gate 10 has permanently closed in preparation for construction of Terminal 1.5. Gates 12A and 14 are temporarily closed for renovations. The pedestrian bridge connecting Parking Structure 1 and the terminal is closed, with signs placed to direct passengers. Tom Bradley International Terminal (B/TBIT): Gate 131 is closed for construction of improvements to the baggage handling facility, and Gate 132 is closed for work related to the Midfield Satellite Concourse. 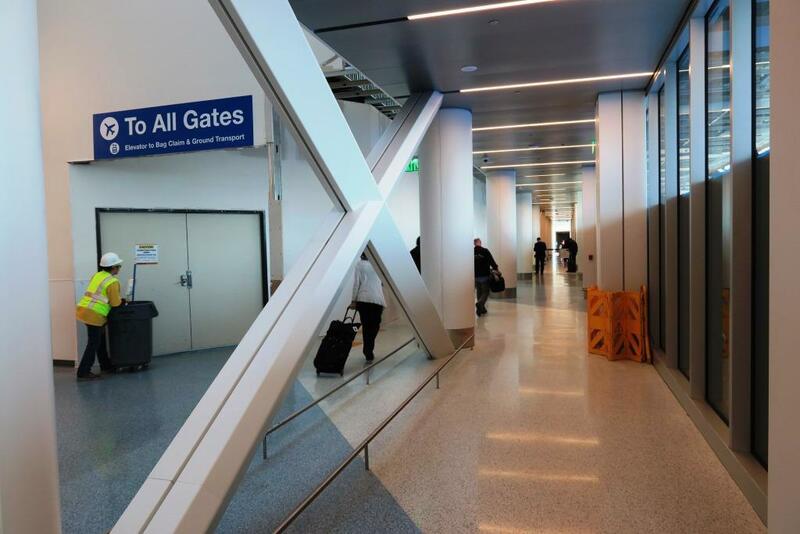 Passengers using Terminals 4-8 are able to access shops and restaurants in Terminal B/TBIT without having to clear security a second time by using the Terminal 4 Connector. Two more Automated Screening Lanes have opened, bringing the total to 12 of the upgraded lanes in the Security Screening Check Point. The lanes are expected to process approximately 30 percent more passengers per hour than the standard equipment they replace. The final two lanes are expected to open by early April. Terminals 7/8: United Airlines is continuing its $578-million Terminal 7/8 Renovation Project scheduled for completion this summer. All of the gate areas in Terminal 7 have been renovated. Skycaps will be moving to new podiums in front of Terminal 7. The carpet in the connector between Terminals 6 and 7 will be replaced with a new terrazzo floor. Gate 86 B (old Gate 88) has reopened, with work continuing on Gates 84, 85 and 86A. The men’s restroom near Gate 83 is closed for renovations, with customers directed to restrooms near Gates 81 and 86B. A new water bottle filler is available near Gate 83. Construction on Terminal 1.5 will narrow the sidewalk between Terminals 1 and 2 on the Lower/Arrival Level. Access to the upper levels of Parking Structure 4 is restricted while work takes place to build new ramps inside the structure. Levels 4 and 5 (roof) of Parking Structure 4 can be accessed only through Parking Structure 3, using the bridge between the buildings. Vehicles parked on Levels 4 and 5 of Parking Structure 4 will exit through Parking Structure 3. Detour signs are posted. The public entrance to Lot C from Westchester Parkway is closed, along with portions of the parking lot. About 1,900 spaces remain in Lot C, which can be accessed from 96th Street. Motorists may wish to consider other parking options or use public transportation during busy periods. Geotechnical investigation work will be occurring in Manchester Square starting on March 6 and lasting for three weeks. This work will occur behind fenced areas. Please note that all dates provided in this notice are subject to change. Up-to-date construction alerts showingterminal looproadway lane restrictions and sidewalk closures, as well as a pedestrian walking map and helpful airline terminal finder, can be found at www.flyLAX.com. LAX also partners with Waze, the world’s largest community-based traffic reporting app, to provide enhanced information on conditions inside the airport and on nearby roadways.